The Homeschool Share Blast sumbission are up and there are some great new units to choose from! There are units on Ancient Egypt, Ancient Greece and Ancient Rome, Months of the Year lapbook (which my youngest sorely needs), Chemistry, Mozart, Spanish, Math thru Literature, Habitats, Inventions and tons of things for the Workbox system. I've only mentioned a very few things - these were just the ones that jumped out to my eyes that we could use. My first unit study is there also - The Revolutionary John Adams. It's very cool to see something you wrote posted online and it feels good to give back a website that has helped me out tremendously with my homeschooling. It's like Christmas in July! Click on the link to Homeschool Share on my sidebar and check out the 'What's New'. It's been a long year. I'm still trying to find the magic 'thing' that works for the boys. I'm pretty much resigned to the fact that it's going to be a constant challenge. Right now we're using Time4Learning, Math U See and CLP's Bible studies. We're also doing unit studies as needed. The boys all really like the computer part of curriculum but Time4Learning's Social Studies and Science need supplementing. I've also come to the conclusion we need to school year round. Otherwise they just lose too much. I sumbitted my first unit study to the Homeschool Share Blast. It was so much fun to do and HSS guidelines were very easy to follow. 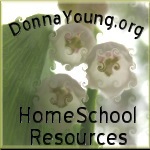 One of my favorite sites is Homeschool Share. There is something for everyone there and best of all it is free. I really love their Bookbag of the month. It's full of hands on activities and other goodies. Teacher Book Bag has lots of other great hands on materials. I've been eyeing that Ronald Reagan lapbook since they came out with it. I also ordered their 5 book - American Votes Epack and can't wait to use that as well. Remember Me Pockets by Fortuneately For You Books. They have a calendar that highlights special events and famous birthdays (authors, historcal figures) as well as activities surrounding the monthly theme or author spotlighted.